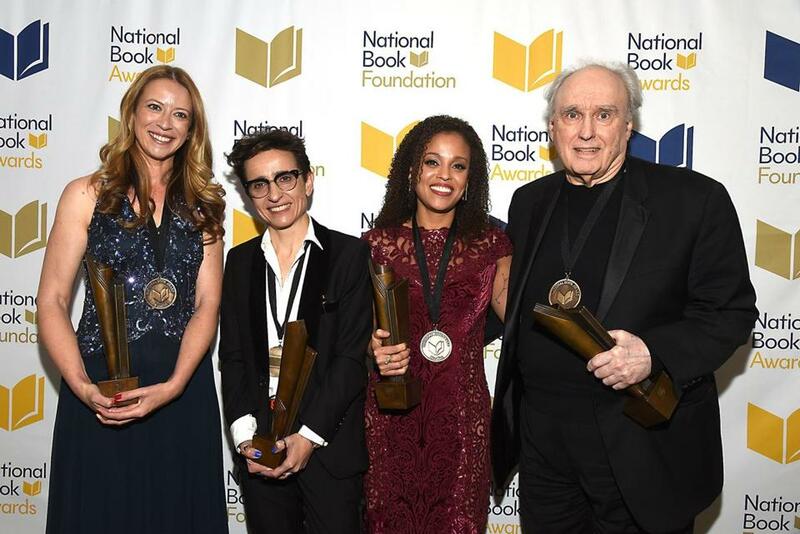 National Book Award winners (from left) Robin Benway, Masha Gessen, Jesmyn Ward, and Frank Bidart. Among his other honors, Bidart, a Cambridge resident who teaches at Wellesley College, has been a finalist for the National Book Award four previous times, but this is his first win. “It turns out that the dice can roll and roll, and every once in a while it turns out different,” Bidart said in a phone interview with the Globe. “Half-Light” is a collection of Bidart’s poems from over the past five decades, including all his previous books. He said that looking back, he’s able to see how his work has changed over the years. Bidart’s poetry is often autobiographical. A Harvard graduate who was raised in conservative, oil-rich Bakersfield, Calif., Bidart came out as a gay man while still in grad school. The other winners of this year’s National Book Awards were (from left, with Bidart) Robin Benway, whose “Far From the Tree” won for young people’s literature; Masha Gessen, whose “The Future Is History: How Totalitarianism Reclaimed Russia” took the nonfiction prize; and Jesmyn Ward, for “Sing, Unburied, Sing,” the fiction honoree.